Judge Sharon A. Krogh awarded Elsa Best of Winners from the Bred By Exhibitor Class which gave her a second major. It was an interesting day with 50 mile per hour winds and rain that came down in buckets (to the point that the show was suspended for 45 minutes just prior to the Tibbie judging). Elsa hung in there and came through even though she was not impressed by getting her feet wet. 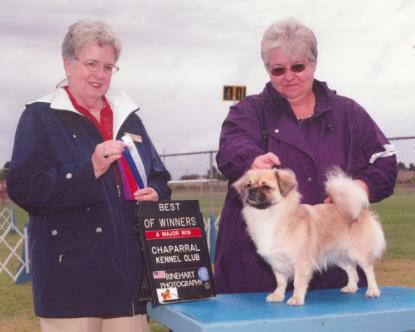 Elsa received her first major win under Judge Barbara Dempsey Alderman at the Lost Dutchman Kennel Club show on April 12, 2008. This was Elsa's first time in the ring! 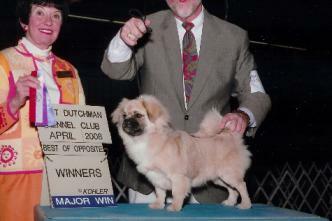 Her brother, Ruya Sarai's I'm Too Finiki for You "Prescott James" was awarded Best of Winners at the show for his first major win . . .
Can you say "too cute?" As a tiny pup, Elsa's routine was to eat all she could and then crash in the food dish. Here she is with her littermates following a meal. Notice that it is only Elsa that is covered in food and the other puppies aren't laying in the dish. What a mess to clean up, but, isn't cleaning up messes what puppies are about? Choosing a name for your new puppy is always hard but when you have to have both a call name and an AKC registered name, things can get complicated. My new Tibbie puppy was named originally after one of my students who is quiet but has a mind like a steel trap. She is very one-minded and smart. I thought this was the way my puppy would be so I named her "Elsie". Later it was changed to Elsa but that is another story. I knew I had to use the kennel name, Ruya but then, what to do? Phyl and Robert have named dogs after cars before so when they told me that, I thought about the shape of Elsa and about the amazing cars I had seen in Europe as a child. Then my interest in Buddhism came into the picture. Afterall, this breed comes originally from Tibet, a Buddhist country and one of great interest to me. Suddenly, the beautiful sports car from my youth, the Lotus Elan popped into my head. Lotus:Buddhism. The word Elan, in French, also has the meaning of enthusiastic vigor and liveliness; distinctive style or flair. What word better describes my puppy? The last word, Poupette, means "little doll" but this name was evoked by Elsa's fascination with "poop". She is outgrowing that now but when she was very small, she would pick up my other dog's poop and her own like it was chocolate candy. I called her "Little Miss Poopy". My co-owner didn't think that was a proper name so I kept that memory by using the French word "poupette". It still makes me smile; it is my little private joke.